I love small pleasures. The little things in life charm me more than the big once-in-a-lifetime surprises. Mostly because once-in-a-lifetime is too seldom. But I can experience small joys every day. 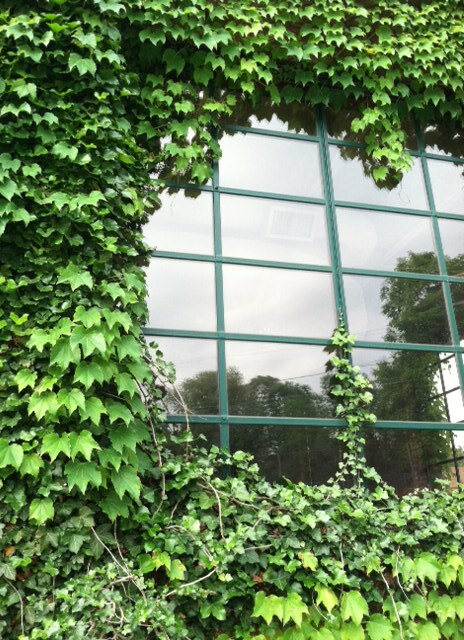 Like the ivy that grows on the building I work in. 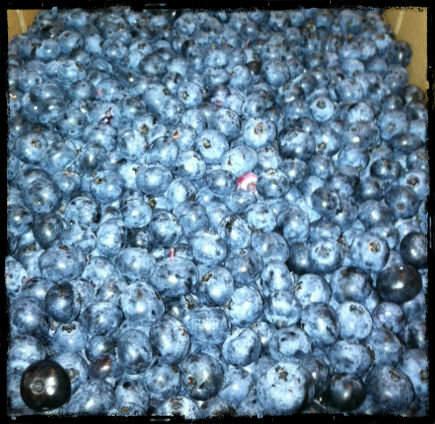 I love blueberries. And I have blueberries for breakfast every morning. I can be happy every morning! But once in while a simple pleasure can actually be a double pleasure. For instance, I love getting into my car after it’s been baking in the sun all day. I love that dry heat that goes right into your bones. (I have very cold bones). And here’s the kicker: just when I think, “Okay, now I’m getting too hot” – the air conditioning jumps up and that feels great too. A two-phase pleasure. And peonies! A few days ago, I cut the last of our peonies and set them on the table. So pretty. And my husband walked into the room… he of the stuffiest, least-functioning nose on the planet – and he said, “It smells so nice in here!” Oh, so nice to have beauty AND fragrance. I realized last night that the shoes I was wearing were really comfortable. 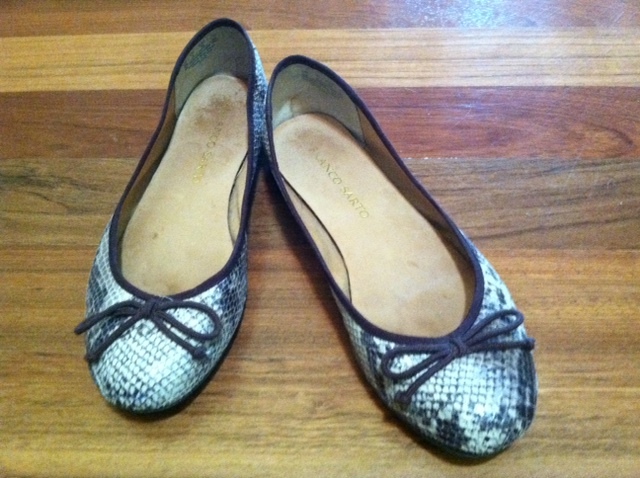 I had worn them all day, and it was well into the evening and my feet didn’t hurt. My toes didn’t hurt, my heels didn’t hurt, my instep didn’t hurt, my bunion didn’t hurt. My feet felt great. And the bonus bit of happiness: those shoes are really cute! And the beach! There are so many pleasures at the beach. I love the sun, the seagulls, the sound of the waves, the joy of little kids running on the hot sand in that tiptoeing sweet way. The beach is a multitude of delights. And just when you think it can’t get any better – you stop for ice cream on the way home. I also have cold bones…..I keep lightweight “wraps” in both vehicles in the summer for those frigid restaurants and supermarkets. And the beach…well, you know how I feel about the beaches, especially a particular one with wild horses…. I want so badly to go to the beach with the wild horses. When is the best time of year? Probably from about May/June through September. They seem to be on the beach more in the summertime. Please let me know if you decide to go – I’d love to drive down and meet you. It’s only about a 2 hour drive for us. Wow, so great! I was extra happy today because all my kids ate breakfast and lunch at generally the same time and my crock pot recipe was awesome! Small pleasures are the best! Your joy in those little things is positively catchy! 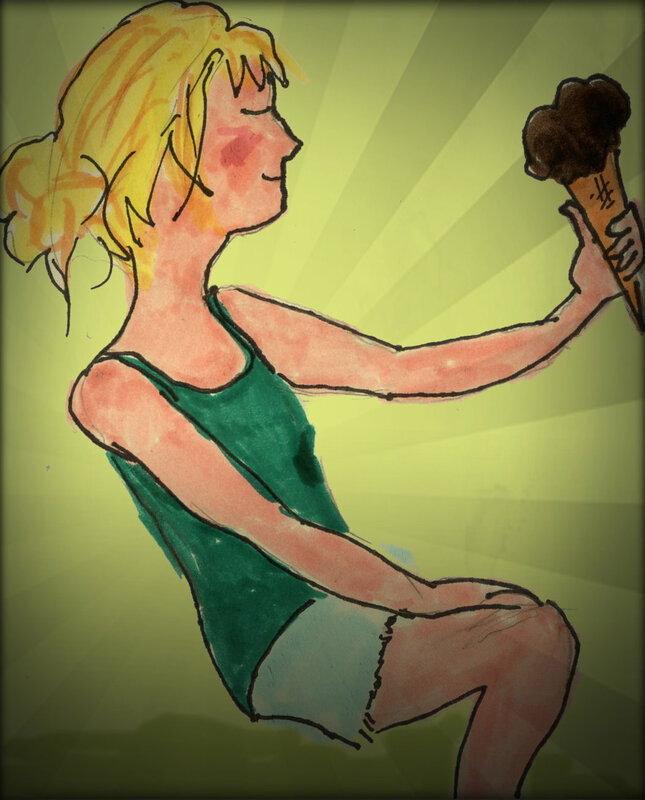 And ice cream after a great day at the beach – what could be better? I love this post and your illustration. This is so sweet. It’s true, the little things are the ones that actually cause the most happiness. You know what’s really fun? Making a loooong list of all the little things in life that you love. Then when you stumble across it later it makes you happy all over again. What a fabulous idea. How many times can I put potato chips on the list? 🙂 Probably as many as you please! Life’s simple pleasures are always the best! Thanks for reminding us. My pleasure (so to speak). What simple pleasure do you like? A lovely reminder to celebrating life’s small pleasures, every day. Oh yes! Coffee is WAY up there. Especially the very first sip of the day. Mine is the first mocha latte of the day but I also love a hot car on a summer day. My friends think I’m nuts but it feels like a wonder sauna. The older I get the more I appreciate the small things. I love a hot car! Always have. It warms me to the bones, and as I wrote, I have very cold bones. I sometimes use the seat-heaters even in the summer. What a lovely post. We all need to remind ourselves of the simple joys in life, they are around us every day if we just take the time to be aware of them. Happy weekend! I plan to do a lot of gardening. That makes me happy too. Just reading about your small pleasures made me happy. I share many of them with you, especially the one about the beach and ice cream after (or on the way). Hard to beat ice cream and sunshine. Enjoyed your pleasures. It’s true – the simple, every day things give the most pleasure. They are our real life, not the once in a while big celebrations. You’re right. Taking pleasure from “smelling the roses” is where it’s at. If you enjoy the simple things, you can feel happy a lot more often. Reading your blog is One if my little pleasures 🙂 Have you ever heard of à book by French writer Philippe Delerm? You might love It : La Première Gorgée de Biere, translated variously as The Small Pleasures of Life or We Could Almost Eat Outside, actually means ‘the first sip of beer’, and it is a collection of those tiny moments like “staying for dinner with friends while that wasn’t planned, going to the bakery early in the morning before breakfast”. Bisous from France. i will definitely read that book! It sounds perfect. Love all of these, but Blueberries oh my and Peonies my absolute favorites. These are truly great Nancy. And not even rare – you can enjoy them often! And picking blueberries is such a sweet peaceful joy too. That song came on again yesterday…. and I smiled all over again. I just bought some fresh cherries — a definite pleasure, especially when they are on sale. I also enjoy seeing something I am knitting gradually turn in to what it is supposed to be. Both the cherries and seeing your creation take form – both Wonderful Wonderful! You’ve got a great list there. Looking at grass in the sun, that’s one I’d add. Nice. With the dew still on it. Indeed, sometimes it is the simplest things that give us the most pleasure. I use to love my commute from my home in Niagara Falls to the studio in Burlington because I had to leave so early that I got to watch the sun rise every morning. It was always magical to see and set the tone for the rest of the day.